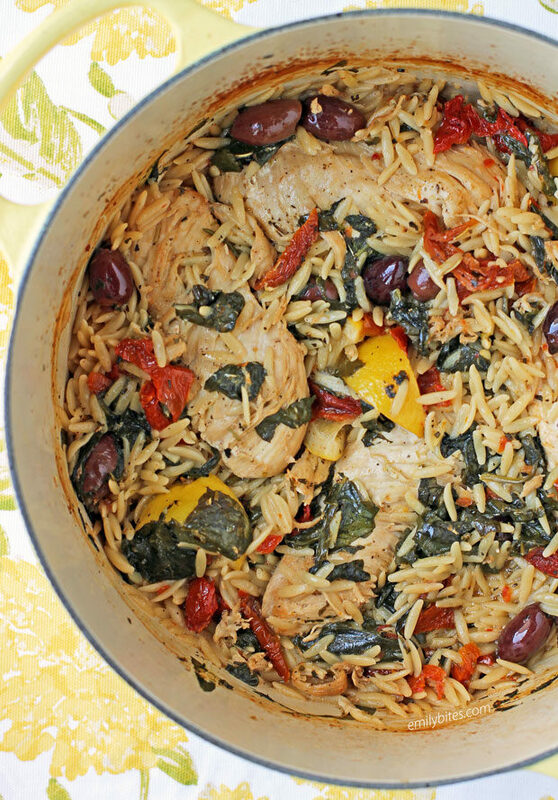 This One-Pot Mediterranean Chicken with Orzo is full of bright lemon and herb flavor, and it’s so easy to make. Perfect for a quick weeknight meal! You’ll just brown up the chicken, then toss everything else into the pot and bake! Lemon is one of my favorite Spring flavors, and it’s perfectly complemented by the rich kalamata olives, tart sun-dried tomatoes, healthy spinach, and Mediterranean herbs in this dish. I love that the chicken and orzo cook together in the same pot, so it’s a main dish and a side dish all in one. Better still, a perfect portion of this dish is just 372 calories or 6 WW Freestyle SmartPoints! 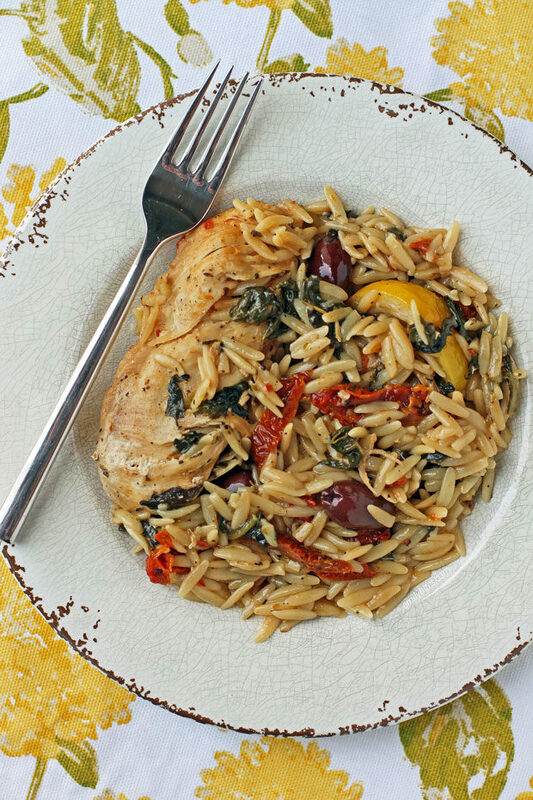 I also think this One-Pot Mediterranean Chicken with Orzo pairs really nicely with a glad of white wine. I’m just saying! Looking for more tasty, lightened-up one-pot meals? Check out my One-Pot Spicy Dirty Rice with Chicken and Sausage, Spanish Chicken and Rice Skillet, Beef Enchilada Pasta Skillet, Turkey Sloppy Joe Pasta, Chicken Pot Pasta, White Chicken Chili, Mexican Chicken Cauliflower Rice Skillet, Thai Turkey with Carrot Noodles, Lemon Chicken Orzo with Tomatoes and Asparagus, Rustic Sausage and Potato Skillet, One-Pot Cincinnati Chili Spaghetti Bake, Beef Stroganoff, Beefy American Goulash, Spicy Taco Gnocchi Skillet, Pumpkin Alfredo Tortellini Skillet, Cheesy Chicken Veggie Pasta Skillet, Sausage Tortellini Skillet, The Best Turkey Chili, and more in the One-Pot Meal category of my recipe index! Pre-heat the oven to 400 degrees. On a cutting board, sprinkle the chicken breasts on both sides with salt and black pepper as desired. Pour the olive oil into a 4-5 QT Dutch oven and bring over med-high heat. Once the oil is hot, Add the chicken breasts and brown the outsides in the oil for about 5 minutes, flipping once in the middle to get both sides. Stir in all remaining ingredients (orzo, broth, spinach, olives, sun-dried tomatoes, lemon juice, lemon wedges, oregano, basil, rosemary, salt and pepper) to combine. Cover the Dutch oven and transfer it to the heated oven. Bake for 25 minutes or until the chicken breasts are cooked through and orzo is tender. Stir together, remove the lemon rinds and serve. Can this be made in an instapot? Probably! I have never tried it, but if you try it out let me know! This sounds wonderful! Tell me where in my store to look for dry-packed sun dried tomatoes. I’m used to just seeing them in jars packed with oil or water. I usually find them by the salad toppings, but sometimes by the jarred ones depending on the store. If you can only find the jarred kind those will also work, the ones packed in oil will just likely change the nutrition info/points. I hope you love this dish! If I don’t have a dutch oven can this be made in a normal large pot? As long as it’s oven safe! Alternatively, you could saute the chicken in a pan and then transfer everything to a baking dish and that would probably work just as well. I’ve been making a Chicken w/Olives & Spinach dish similar to this one, ever since we visited our cousins in Italy. I rub the chicken w/salt, pepper, & a small amount of garlic powder. Also, I don’t add the spinach until the dish comes out of the oven (b/c we like spinach, and don’t care to have it shrink down to almost nothing). I add the spinach, put the cover back on the casserole dish, and let it all sit & steam for a couple of minutes. Lift the cover & mix everything together.Thanks Emily, for posting this delicious recipe. can you make recaipe indonesian food? I used breasts that I trimmed to be 5 oz each and the time worked out for me, but everyone’s oven cooks a little differently and the thickness of the breasts could definitely be a factor. If your breasts are really thin you could definitely try cooking for less time next time. I’m glad you loved the flavor! This was so good and so easy! I followed the recipe exactly. I wasn’t exactly sure how much 4 oz of pasta was, so I weighed it out. It was just a bit more saucy than the photo, so i probably could have added more orzo- but OMG it was delicious, quick and easy! We absolutely loved the flavor of this dish!! We do not have a Dutch oven though so I followed your suggestion in another post to sauté the chicken and then transfer everything to a baking dish. We had tons of liquid left over though after everything was cooked…looking back now I covered the baking dish and you didn’t say to do that. Could that be why or did I mess something else up? Haha. Thanks for sharing your recipes they are a weekly staple in our home! I made this for lunch meal prep and it was great even with leaving out the olives. I was able to get 3 lunches from this recipe and it warmed up well. I just got a Dutch oven & was so psyched to try this–I always have good results with your recipes, Emily! This one was no exception–loved the flavors in this one! And oh man did it look beautiful in my Dutch oven–would be such a good one for entertaining! It looks impressive without too much work…my favorite kind. Thanks again for your recipes! !